Meet the new STD of 2013 : Socially Transmitted Disasters. Just like traditional STDs (Sexually Transmitted Diseases) they are spread by intimate unprotected encounters. Socially Transmitted Disasters are the nasties you can pick up from social media when you get intimate with the profiles and pages of people and brands. 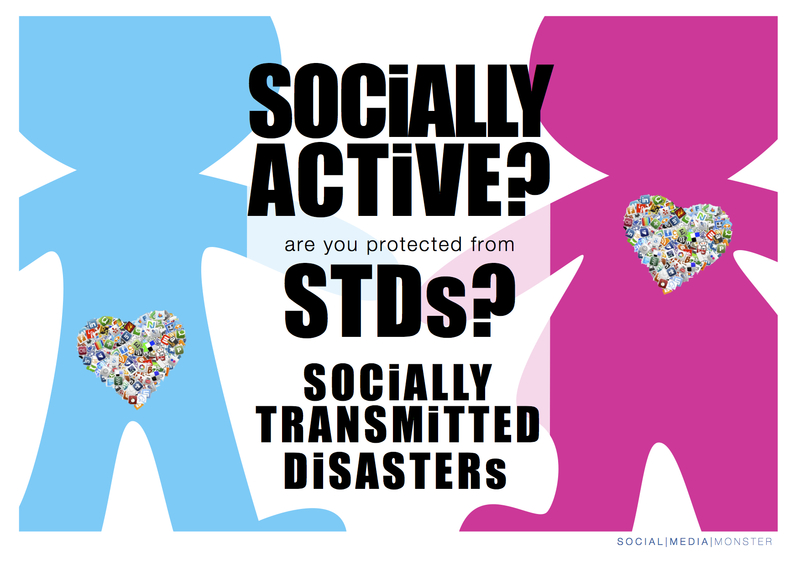 A Socially Transmitted Disaster (STD) is an interaction on social media that has, or has the potential to, cause you or your brand harm. STDs can be caused by something you said or did online, something you didn’t say or do – or something someone else did or said. STDs often spread from offline encounters to online networks rapidly – often with a running commentary, photos and video. Once contracted, an STD isn’t easily or quickly cured: it’s symptoms often lay dormant in Google’s cache only to be resurrected via meme or case study, causing spontaneous unpredictable outbreaks. If you are bound by employment codes of conduct that apply outside the office; simply ‘Liking’ an immoral or objectionable page, post – or being a member of a group is enough to give you a case of STDs. Unwanted fauna setting up camp isn’t just an offline problem. Online, these microscopic gremlins – Trolls and SpamBots – are just as pesky and take some serious extermination efforts to eradicate. The damage trolls and spambots can cause is staggering: they can effectively cripple your social feeds and inflict targeted vitriol at individuals and brands. Sometimes it’s in response to something that has been said or done on or offline, at other times it’s simply a sport they like to play for psychopathic fun. The reality is, no-one ever trolls you with compliments or goes to the trouble of setting up spambots that tweet your account at warp speed with praise. Trolls and spambots are outright cyber bullies, adding a new layer of complexity to your infestation problem. For brands this equates to Workplace Health and Safety risks to the employees working within your communications and social media spheres. For individuals, without any professional support – things can quickly escalate out of control. Think you can pull the plug on your social accounts just before the big #PRFail climax? Congratulations! You’re now the proud parent of a PR and Social Media Disaster! Ignorance to the methods of social protection on the market is no excuse. 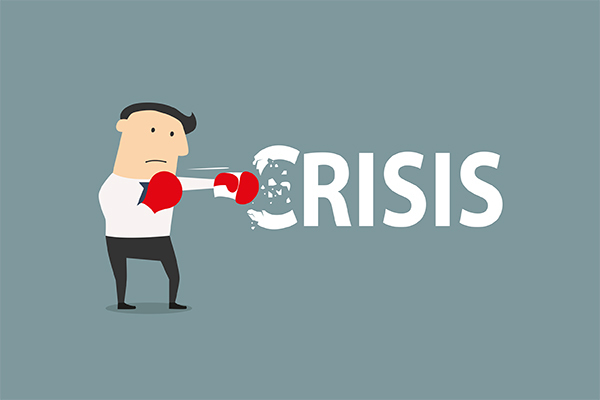 A brand’s social media strategy must include a crisis management plan and social risk assessment. Any individual on social media should have a working knowledge of the privacy settings associated with each social stream and how each social network differs. 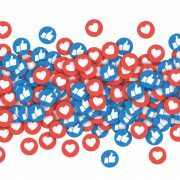 Social Media Crisis Communicators are unanimous in recommending that brands employ social protection over social run-for-the-hills strategies. One of the worst possible actions for a brand to take is to hit the delete button; be socially silent or to issue a contrived, on script corporate or bureaucratic response to the #PRFail. In the case of an individual’s social stream meltdown, privacy is the key. Lock it down – keep low and move fast. No one is in control of your own privacy and social settings but you – if you have lost control, regain it as quickly as possible. Privacy – will give you some element of control, but it won’t save you from the law if you’re socially irresponsible. Passwords. “Password” isn’t a password. Come up with a good one, and change it regularly. Don’t use the same password for all your social media streams or online activities. Common sense – If your employer has a social media policy (or code of conduct) that governs your extra-social activities then you need to be very clear on you likes, comments and associations. You cannot hide behind ignorance or ‘personal views’. Yes, we live in a democracy. That means you are free to believe what ever you so wish, but you aren’t free to promote, publicise or espouse objectionable views which are against any number of laws including discrimination and racism. If you aren’t prepared to stand up in front of your family and colleagues with the same views and predilections, then you shouldn’t be humouring the same content online. No level of online privacy will save you from the law – nothing is ever truly deleted from the internet. If your online profile is important to your career, or you are uber paranoid- set up some basic monitoring. Apps as Mention can give you an idea of what is being said about you online as-it-happens. If you find yourself with a serious case of the STDs and it is significantly effecting your offline life: get appropriate help. Whether that be calling a helpline or contacting a company that can help you regain control over your Google ranking, seeking help early is essential to your long-term recovery. The Australian Government’s Stay Smart Online has a great suit of resources for individuals. 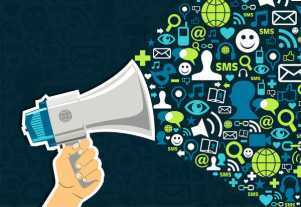 Hire expert communications advisers who possess strong social credibility. Strictly control who has the keys to your social media accounts: and manage HR issues (such as redundancies or layoffs proactively). Have a social media policy for your workplace and employees. Australian leading social media law firm Pod Legal are experts in this field. Train your staff – not only in best practice online communication, but also anyone who has any input or decision making authority about what appears on your social streams. Educate your C-Suite and engage your shareholders. Nothing can protect you more than vigilant social media network monitoring. Monitor your social spheres based on your risk profile. For example, hashtag and keyword monitoring should occur at a minimum. Consider using apps such as Mention for brand ambassadors or notable individuals connected to your brand (such as the CEO). Enterprise solutions that should be considered include Hootsuite for Enterprise and Salesforce. Employ enterprise grade protective solutions if your risk outweighs your resources. Depending on your requirements, there are a range of solutions on the market including Australia’s own Netbox Blue and the U.S. based Nexgate. Do not equate the price of protection with immediate unaffordability: price the cost of bad publicity for your brand what the total cost of resources and loss of business as usual (sales) will likely be to respond to a social media disaster and repair customer confidence. Like insurance, having enterprise grade solutions in play in a business-as-usual construct will save you time, money and resources when you do contract a STD.